Is he sick? No. Worse. He’s discouraged. There can be no better way to get into the festive spirit than with the family to join the throng packing out the Phil for the Christmas Eve screening of Frank Capra’s evergreen It’s A Wonderful Life. The hall is packed and electric with good vibes – egged on by the legendary kilted organist who will eventually subside into the bowels of the building, always reminding me of the opening credits of Monty Python’s Flying Circus. Before he goes, he leads the audience in the annual ritual of rattling the car keys to ‘Jingle Bells’. he descends, and the screen ascends. Welcome to Bedford Falls! Seeing this film for the umpteenth time, it still remains as fresh and joyous as ever, perhaps even more so. Potter the evil banker is remarkably in tune with the times, while outside – for the first time that I can recall – the Liverpool streets, crusted with hard-packed snow, looked exactly like Bedford Falls on Christmas Eve. It’s funny to think that Frank Capra’s film was forgotten for a two decades until, out of copyright and available to screen at no cost, American TV stations picked up on it, began to screen it at Christmas time in the early 1970s, and from then on the audience for the film began to climb exponentially. Sitting in a packed Philharmonic hall today made me realise what a phenomenon this film has become: families like ours and groups of friends there to experience its Dickensian emotion – a dash of sentimentalism with a bracing twist of social commentary and populism. Frank Capra didn’t intend It’s a Wonderful Life to be a Christmas film, screened only in the festive season. Capra had come to be regarded as Hollywood’s poet of the common man in the 1930s with a series of populist parables such as Mr. Deeds Goes to Town and Mr. Smith Goes to Washington, and Capra wanted It’s a Wonderful Life, the first film he made after returning from service in World War II, to be a celebration of the lives and dreams of America’s ordinary citizens, who tried the best they could to do the right thing by themselves and their neighbours. Now, hold on, Mr. Potter. You’re right when you say my father was no businessman. I know that. Why he ever started this cheap, penny-ante Building and Loan, I’ll never know. But neither you nor anyone else can say anything against his character, because his whole life was – why, in the twenty-five years since he and Uncle Billy started this thing, he never once thought of himself. Isn’t that right, Uncle Billy? He didn’t save enough money to send Harry to school, let alone me. But he did help a few people get out of your slums, Mr. Potter, and what’s wrong with that? … Doesn’t it make them better citizens? Doesn’t it make them better customers? You – you said – what’d you say a minute ago? They had to wait and save their money before they even ought to think of a decent home. Wait? Wait for what? Until their children grow up and leave them? Until they’re so old and broken down that they… Do you know how long it takes a working man to save five thousand dollars? Just remember this, Mr. Potter, that this rabble you’re talking about… they do most of the working and paying and living and dying in this community. Well, is it too much to have them work and pay and live and die in a couple of decent rooms and a bath? Anyway, my father didn’t think so. People were human beings to him. But to you … they’re cattle. Well, in my book he died a much richer man than you’ll ever be. Apparently, in 1947, an FBI analyst submitted a memo on ‘Communist infiltration of the motion picture industry’, with the observation that the film’s ‘obvious’ attempt to discredit bankers ‘is a common trick used by Communists’. Sixty or so years later it seems like a wake up call. 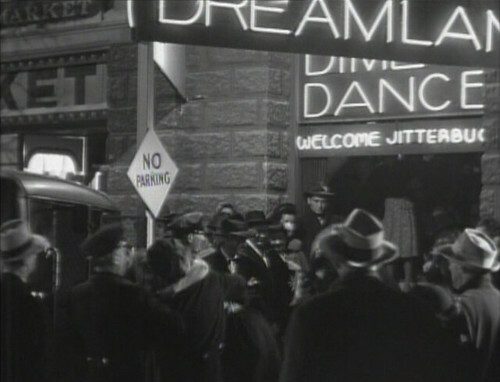 But what I noticed this time was the rambunctious, joyous cacophony of community life in Bedford Falls. It is not the bland, genteel opposite of the decadence of Pottersville, but is full of the richness of life lived well. We all live in Pottersville now. That’s why the emotional audience response to the film this afternoon, and the wave of applause that greeted its conclusion, had, I thought, a tinge of sadness, of yearning – for something lost, or yet to be gained. At a seminar with film students in the 1970s Capra was asked if films could still be made with the kinds of values and ideals found in his films. ‘Well, if there isn’t’, he said, ‘we might as well give up’.